A beautiful smile is one of the most sought-after traits for most people, yet millions of Americans still find themselves dissatisfied with their smile. For that reason, each member of our staff understands how important a smile can be to our patients. We go to great lengths to help improve your smile using a range of treatments such as implants, dentures and dental veneers. Dental veneers, which can also be referred to as porcelain veneers or porcelain laminates, are extremely thin custom-made shells that are designed to cover the front surface of a tooth to improve its appearance. Over time, the shells will bond to the tooth to not just improve the look, but also improve the shape, size, and length of a tooth. Made from porcelain or from resin-based composite materials, veneers are the perfect choice for anyone suffering from dark stains, gapped and chipped teeth, or any other blemish to a smile. 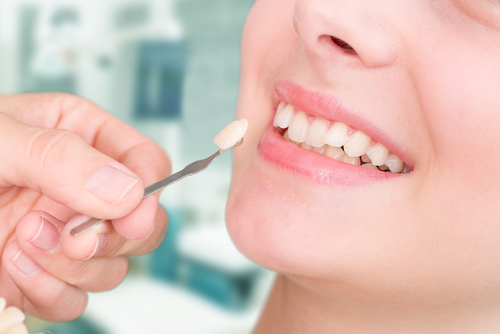 While there are advantages to both porcelain veneers and composite veneers, our doctors will meet with you to determine the best choice based on your specific needs. While we understand that many people suffer from a fear of going to the dentist, our team goes above and beyond to make sure our patients have no reason to experience any fear or anxiety. From a simple cleaning to root canal surgery, making sure our patients are relaxed and comfortable when they come to see us is one of our top priorities. Aside from making our patients as comfortable as possible, we are constantly practicing and following the highest standards in the dental industry. Our level of customer care has made us leading provider of emergency dental services in the Drexel Hill, Lansdowne and Aldan areas of Pennsylvania. Just like meeting someone for the first time, at all starts with a first impression. The first step of receiving a dental veneer is having one of our dentists take an impression of your teeth. The impression is then shipped to a laboratory to be custom-designed to fit your mouth and match the color of your teeth. Next, we will place a temporary veneer over the target teeth. A tooth is prepared by shaving off a small amount of enamel to allow the veneer to fit comfortably along your gum tissue. The temporary veneer is applied with temporary glue to allow you to get accustomed to the sensation of a veneer. When your permanent veneers are ready, the final step of the process can be completed by removing your temporary set and replacing them with your custom-fit veneers. They will be placed directly over your teeth while addressing any imperfections or inconsistencies. Once your permanent veneers are fitted in your mouth, you’ll be ready to show off your new and improved smile. Families from all across the Drexel Hill, Lansdowne and Alden areas of PA have turned to Family Dental Care Center for years for dental veneer services. From just a simple annual cleaning to being fitted for partial dentures, our trained staff is more than capable of handling any of your dental needs. Give us a call today at 484-791-2138 to schedule an appointment.